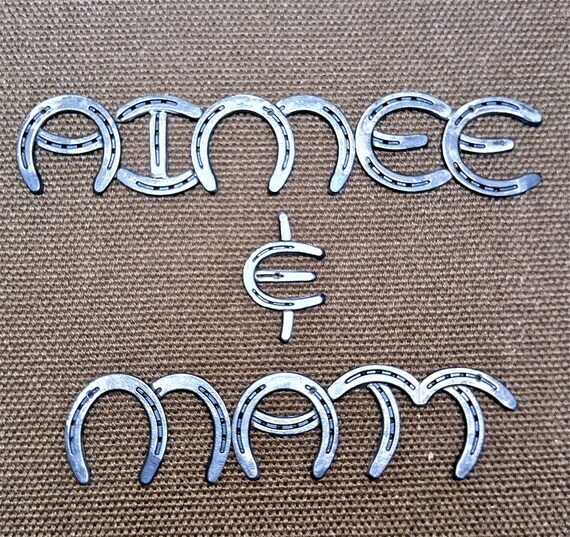 We went to my niece’s wedding a couple years ago and her dad had created some very cool DIY wedding favors using upcycled forks. 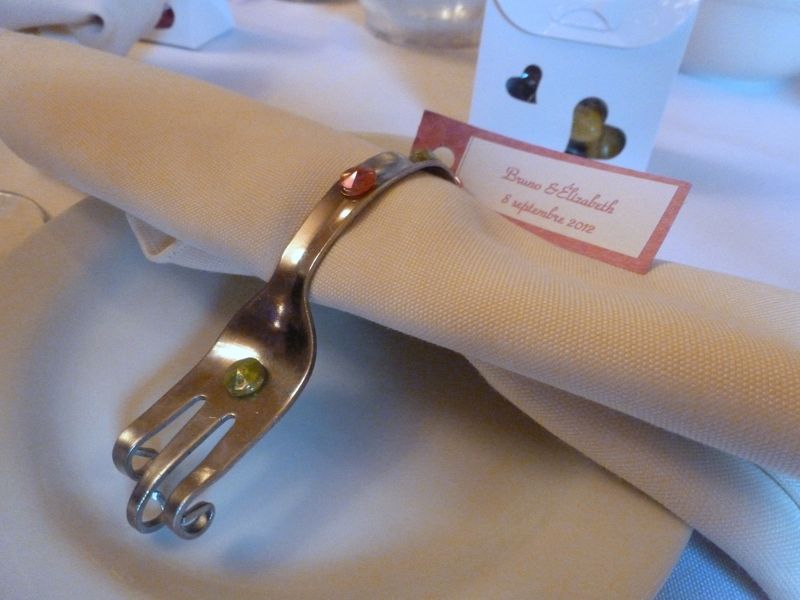 To make the napkin holders he twisted forks with plastic coated heavy duty pliers and brute strength. He glued on a few rhinestones and added a tag with the couple’s names and wedding date. At another wedding my friend commissioned me to make wire silhouettes and she stuck them into the cork tops of tiny glass bottles. In the bottles she layererd colored sand. 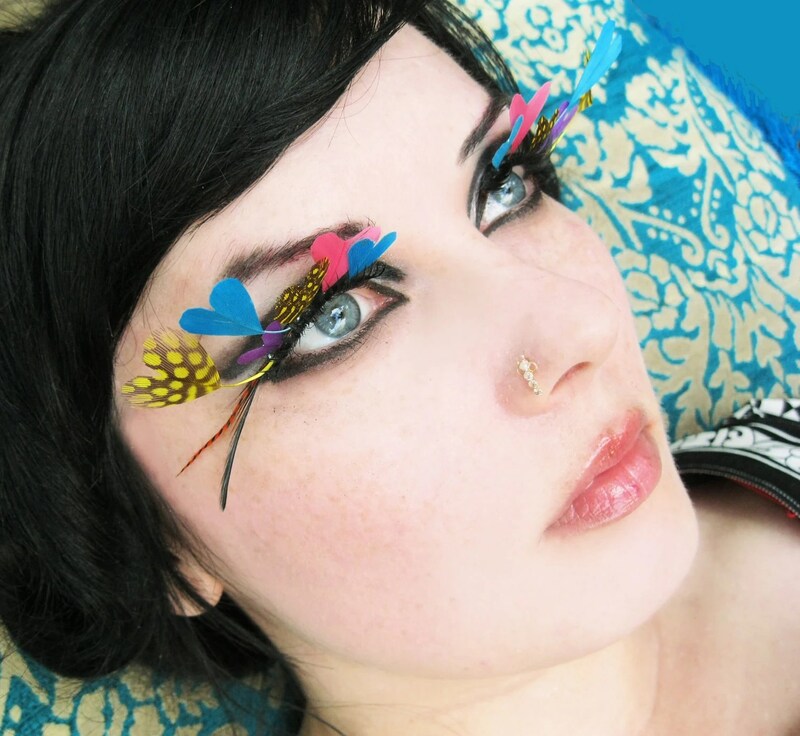 You could do the same thing and make simple wire heart shapes to stick into the lids. 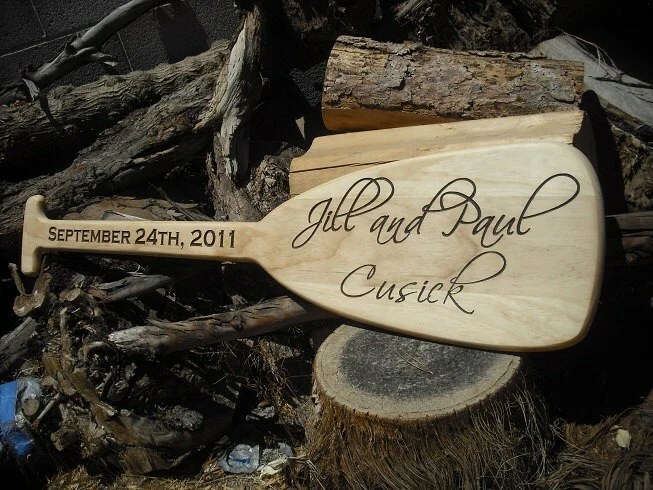 You could also add a tag with the couple’s names and wedding date. There are some other delightful ideas available on the Internet. 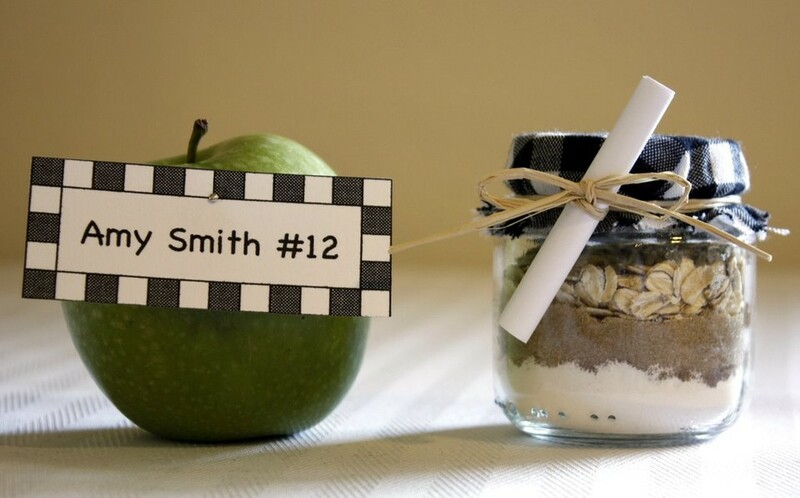 I found this cute idea to give a mini apple crisp kit. Perfect for a rustic chic wedding theme. I like the idea of the DIY bubble blowers. You can make your own and even form the pink pipe cleaner ends in to small heart shapes instead of circles. 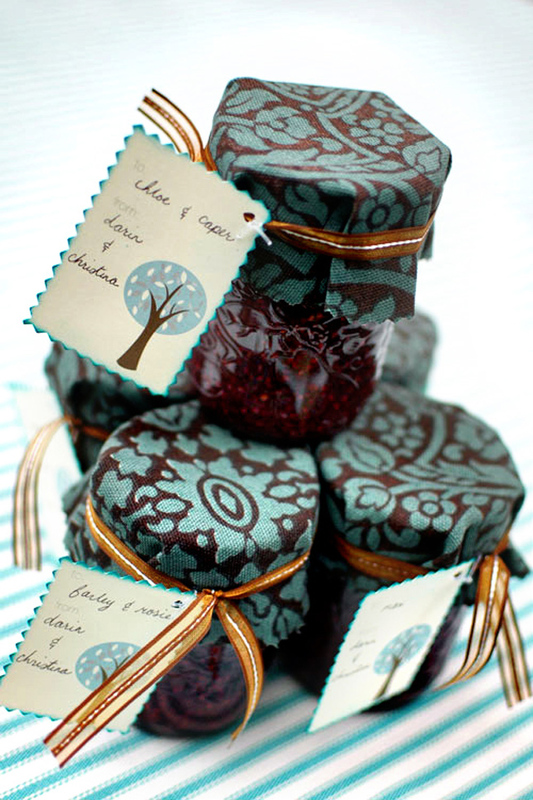 I also love the idea of making your own jam and putting them in small personalized jars. 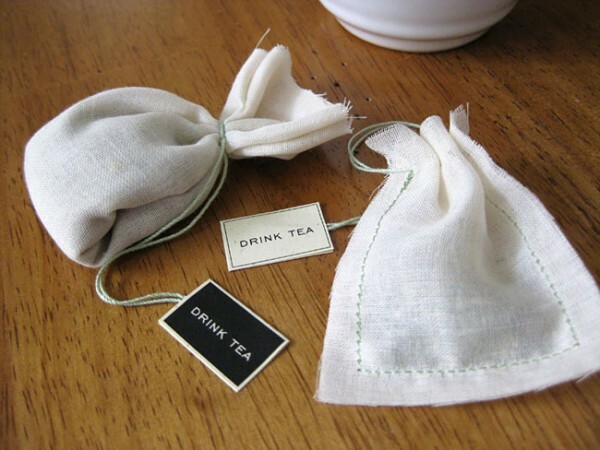 For the sewers and tea-lovers you can make simple re-usable teabags with cotton fabric and a simple straight stitch. 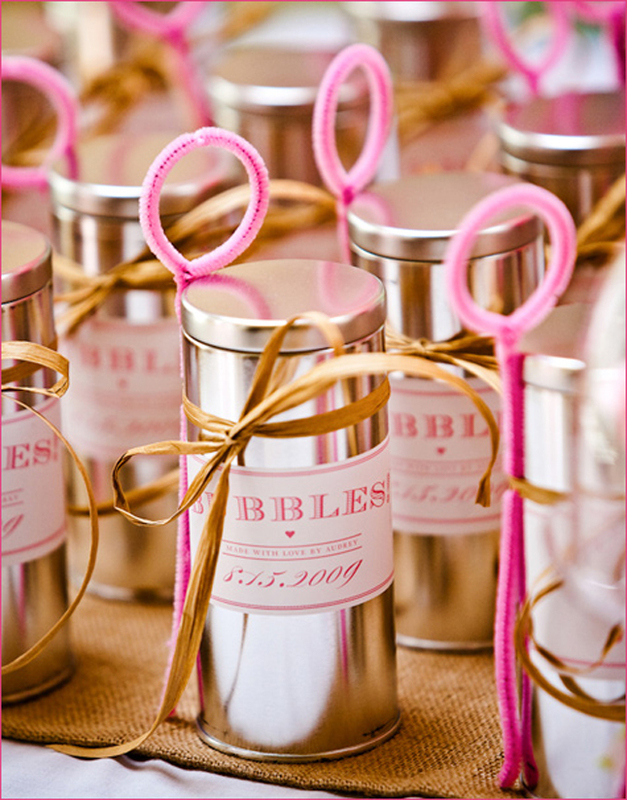 You can print out “Drink Tea” or “Tea for Two” on one side of the tag and the couple’s names and wedding date on the other side. Fill them with some tasty bulk tea from a Specialty tea store or with herbal teas from your garden. Those words can send me running for the hills. Don’t get me wrong I enjoy cooking, most of the time, and when my girls were younger I cooked a lot more than I do now. But answering the question “what’s for dinner and what are we having tomorrow?” just drove me nuts. So when I found this project for a Menu Board I had to try it. 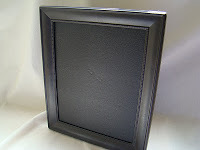 A picture frame with glass (I used an 8.5×11). 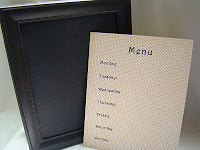 One piece of patterned paper, I used scrapbook paper with a small pin dot so that it wouldn’t obstruct the writing. 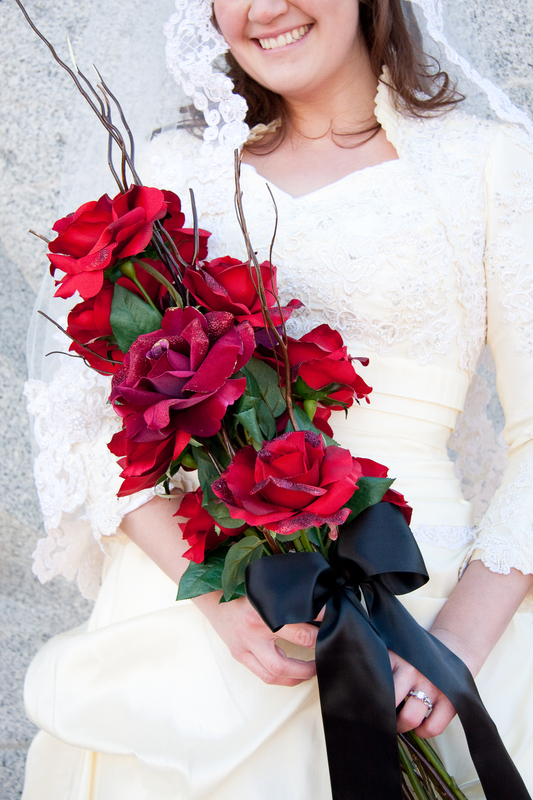 10 inches of coordinating ribbon. 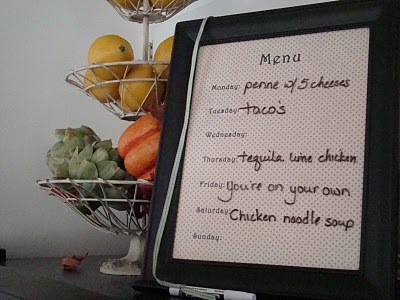 Thin point dry erase marker. Step 1- If your paper isn’t trimmed to 8.5×11 trim it so that it will fit in your printer paper tray. 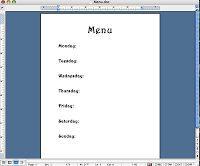 Step 2 – Open up a word processing application (I used Word) and center the word “menu” at the top of the page. Then on the left hand margin type in the days of the week and print. I printed it a couple of times until I got the word placement just right. When I had it the way I wanted I then placed my scrapbook paper in to print. 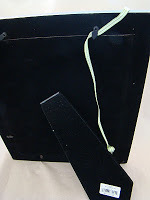 Step 3 – Place the printed paper in the picture frame and close the back. 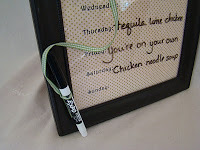 Step 4 – Tie the ribbon around the dry erase pen and attach to the back of the frame. You don’t have to do this step but it keeps the pen from getting lost. And that’s it, you are ready to tell the whole family what’s for dinner or what you’d like them to make you for dinner. 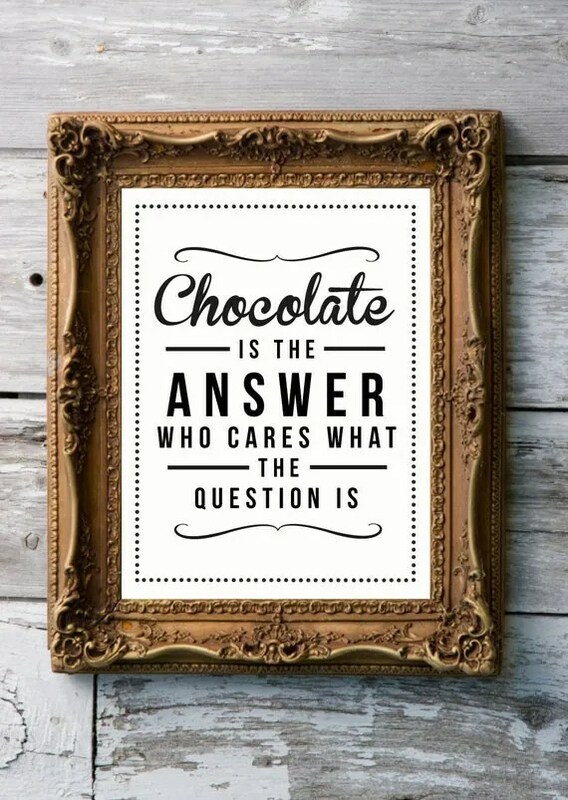 Mine sits on top of my refrigerator and believe it or not my family checks it when they come in the kitchen! 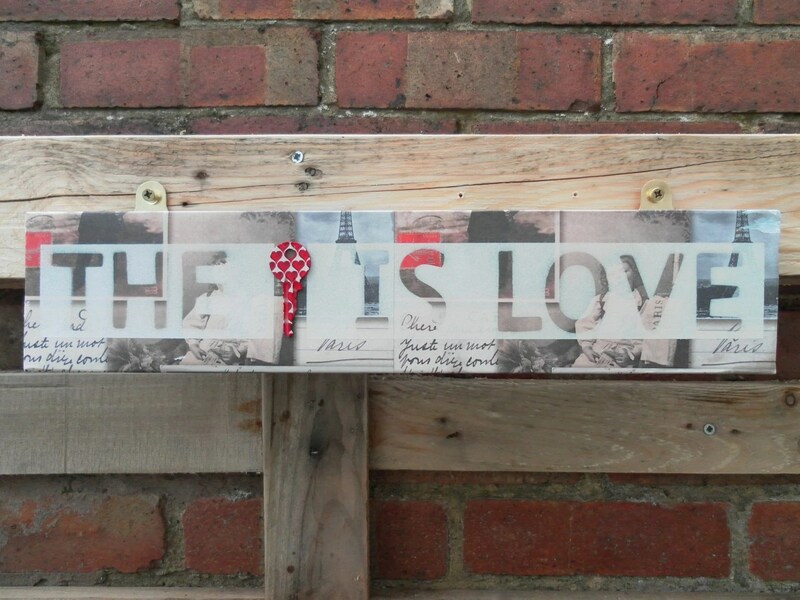 This also makes a great house warming or thank you gift. And don’t forget Christmas is only 88 days away! Let me know what you think…go give it a try! 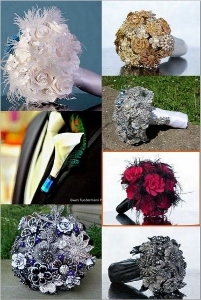 What was your favorite DIY project for your wedding? And your least favorite? Why did you take them on? (Financial reasons, your skills/ability, etc.) And did you DIY it yourself, or did you have help, and from whom? One of my favorite D.I.Y. wedding projects was little white envelopes that held bird seed. 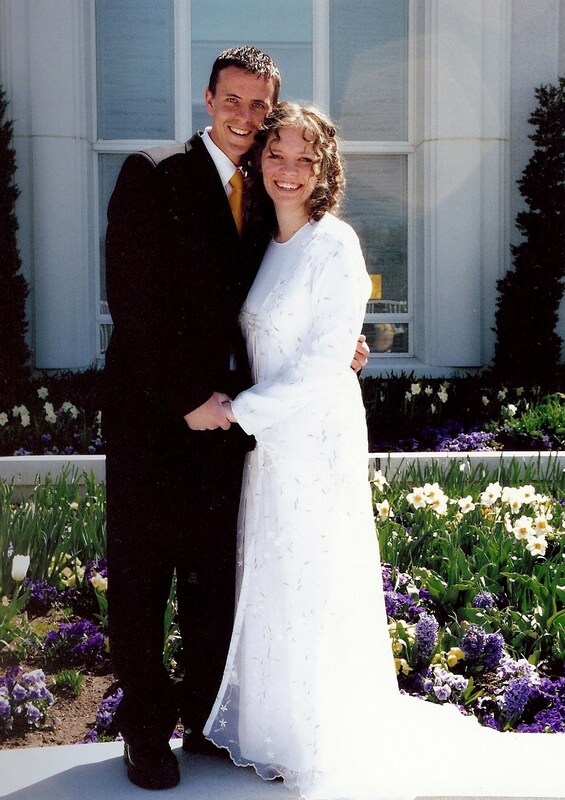 There was one for every guest, and there hadn’t been a wedding in our family for 10 years, so there were hundreds of them. 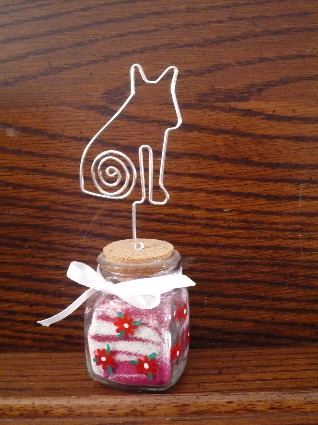 They were purchased completely flat, so each one had to be folded, filled and then a very small rose and ribbon were glued onto the flap to hold them closed. This was my favorite project because it was back when everyone was still throwing rice, and I took it on in an attempt to save some little birdies. It started out as my favorite project, but thankfully I had a lot of help, because it wasn’t long before I had burned every one of my fingers with hot glue. I passed it on to my wonderful auntie and she was still gluing the morning of. My least favorite project was in preparation for the morning after. Since we had so many guests coming from out of town, we wanted to do something that would allow us to spend a little more time with them. We delayed our honeymoon for a couple of days. So my mother offered to host a very large brunch in her home. I was so grateful that I agreed to fill cheese blintzes for everyone. I wish I had asked her how many she wanted to make before I made the offer. lol It was a nightmare! We got married in Caesars in Las Vegas with 50 guests, my mother in law and myself found these cool over sized playing cards in our wedding colours. We took those and made them into our programs to direct the guests to the different locations that we needed to be that weekend. My favorite DIY from my wedding was the centerpieces because they were EASY! My colors were all citrus-y (lime green, tangerine, and bright yellow), so I just bought a crate of lemons, limes, and tangerines and arranged them around the middles of the table with greens (I used salal, because it went so well with the citrus fruit!) and baby’s breath from the florist where I worked at the time. My favorite DIY project from my wedding was creating my cupcake stands. The bakery we used for the cupcakes wanted to charge me small fortune to rent their stands so my mom and I set out to find our own. We ended up purchasing some beautiful glass pieces in all different shapes and sizes from our local Goodwill store. We turned some glasses upside down and used them as a base for some of our platters. We had some platters just flat on the table, some raised to two tiers and the one that held our jumbo wedding cupcake was three tiers high. The end result was eclectic and fun! I wanted a table plan with a difference for my vintage themed wedding last year. An old steamer trunk as a statement piece was going to have to make an appearance somewhere in our wedding…so..we eventually tracked one down on Ebay, the poor thing needed some attention so with a little lick of paint, a bit of repair it looked alive again. My bridesmaids were dressed in 50’s style black and white polka dot dresses, so I found matching material and lined the inside. I then found a vintage fire screen from a thrift store and lined it with the same material..this is were the seating plan was put on. By filling the trunk with dozens of old books and placing the fire screen in it it looked amazing!! The whole look was finished off with a dozen long stem red roses and shabby chic signs hanging from the trunk! 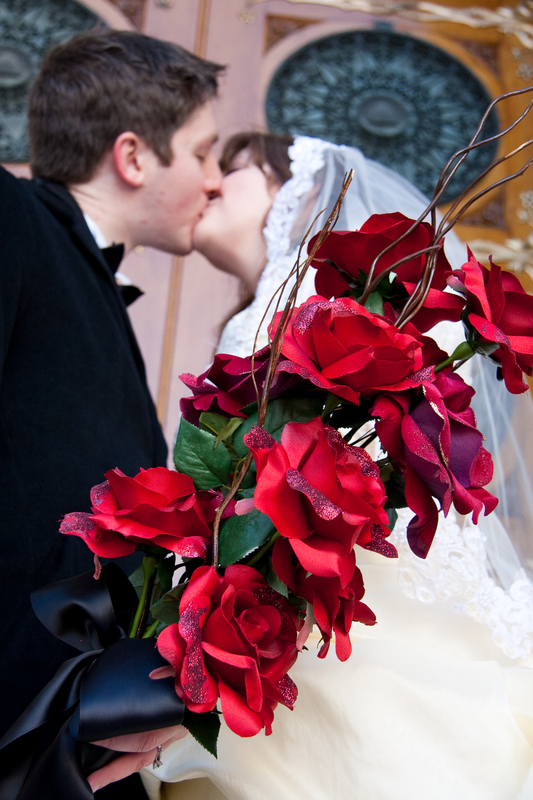 We were on a tight budget while planning our wedding in 2009. (The economy was reeling at the time.) The only way I could create the wedding that we both wanted on our less-than-half-the-average wedding budget was to DIY as much as I could. Invitations, place cards, centerpieces, my veil and headpiece, and more…luckily, we had 18 or so months for me to create everything! My least favorite…was probably my veil. It’s a bit of a funny story. I wanted to reflect the scallops and beading in my lace dress, so I purchased a long plain scalloped veil, and sewed the crystals on individually along the non-so-straight edge. After about 7 hours of work, I was fluffing it out and making sure it was straight and not pulled anywhere…when our cat took one of its lives in its paws. He grabbed the end of the veil in his teeth, and made off with it up the stairs. (I think I screamed, but I am not sure, as I was the only human home.) Whatever I did, I believe I scared the bejesus out of him, as he dropped it and continued running…from me. (And he didn’t come back downstairs for a few hours.) After reviewing the damage, I found that he had torn the veil next to my cheekbone. <groan> It took another week to find a lace that worked with my gown, which I had to sew onto the veil at the top of each and every scallop…just to cover the one rip he made. I love my veil, but I-yi-yi! I know, I know. Tip number THREE, is setting a budget? Most people want to jump right in and start here. But, trust me, this vital step will be so much easier if you’ve already taken the time to prioritize your wedding preferences and talk over money with the involved parties! Here is one which is a little “detail” lacking, but a good start. I do like that they’ve given you a column for “anticipated” cash flow, as well as “actual” cash flow. If you use those columns as you go along, you can make slight adjustments here and there, and will hopefully know if you have enough extra to cover any unexpected expenses. Here’s another drafted budget. This one looks good, but I would highly recommend changing those percentages to better reflect what you decided your priorities would be! You may also want to break down those large categories into smaller, more manageable shopping lists. I am almost certain there isn’t a bride-to-be out there who hasn’t heard the advice of setting and sticking to a realistic budget. And yet, isn’t it strange how many attempt to ignore that advice? Ignoring your budget not only encourages you to stop hunting for better deals, but it often causes greater financial stress among families, including the one you’re about to start! Having the budget written down and keeping it with the things you are using to plan the wedding will help you visualize the process and help you stick to it! As I mentioned in my second post, my parents gave me cash to cover our reception costs. This worked out as a great budgeting tool for me, because I could quickly see just how much we spent, and how much we had left, as we went along. I also pulled certain amounts aside for specific, more expensive, things on our shopping list (like my dress and the rings) ahead of time, so that I knew I’d have that money when I needed it. Wedding signs don’t need to be typical. I love the idea of using the couples personality to make a wedding unique. 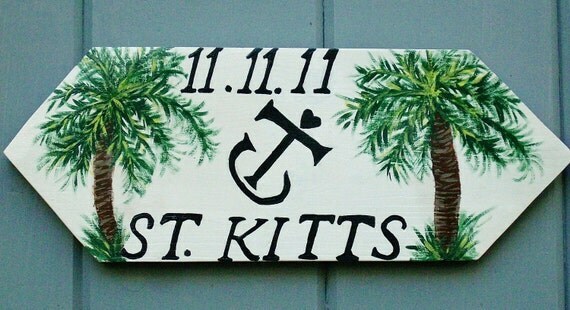 Here are some sign ideas that can be customized to a couple. 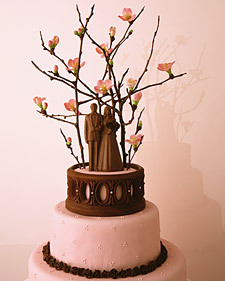 If chocolates are for courting, then the next edible milestone has to be the wedding cake. Ceremonial feasting has always been an important part of weddings. One thing very special about the presentation of the wedding cake is that it has become a dazzling haute cuisine creation that one eats with their eyes as well. However, to gather some inspiration for your own haute cuisine wedding feast, off the multi-tiered track, here is a little history on the wedding confection as we know it today as well as some inspiration from nuptial sweets abroad. It all started with a ring-bearing pie, in fact. The first wedding cakes in Anglo-Saxon tradition were pies which came a quaint tradition much like the tossing of the bridal bouquet or garter. In this ancient custom, a glass ring was baked into the pie. 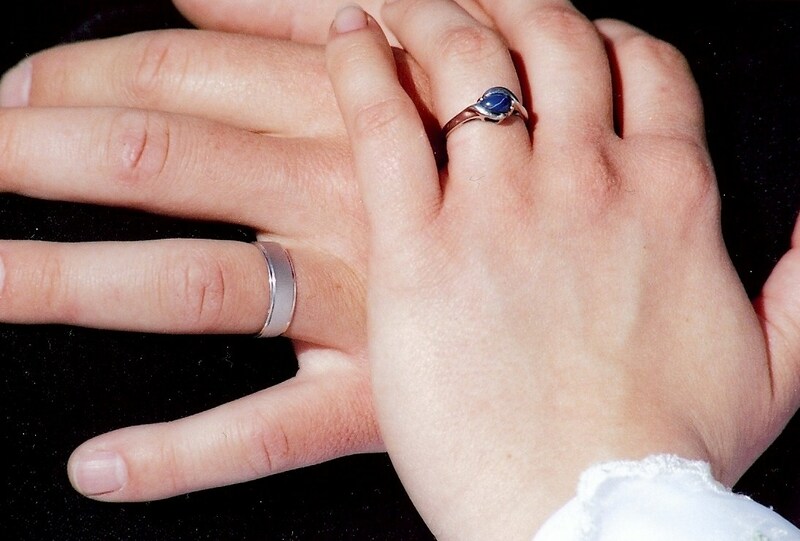 The wedding guest who received the ring-bearing slice would be next to marry. 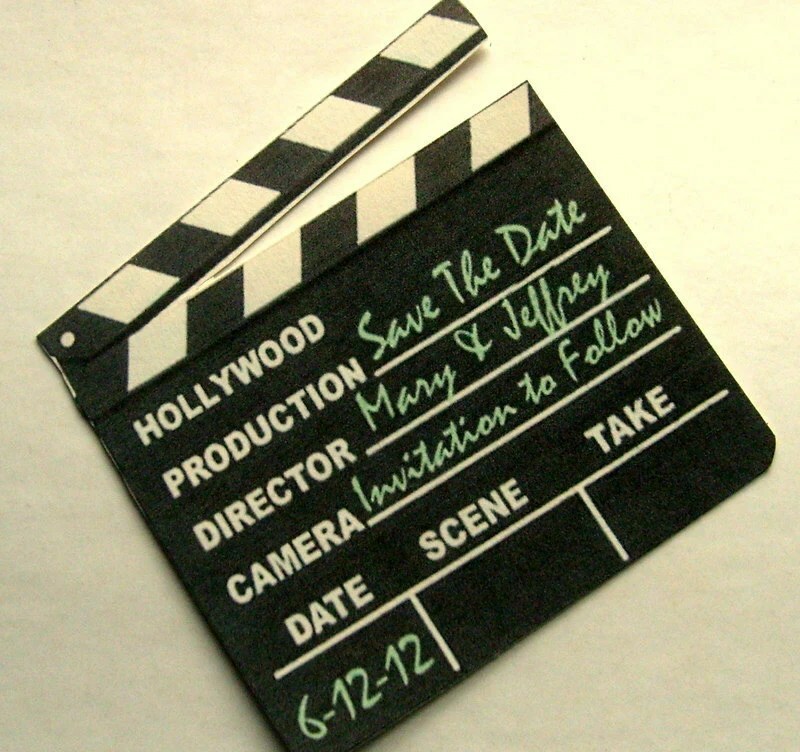 Just be sure you announce this to your guests before serving, so no one cracks a tooth on their romantic good fortune! 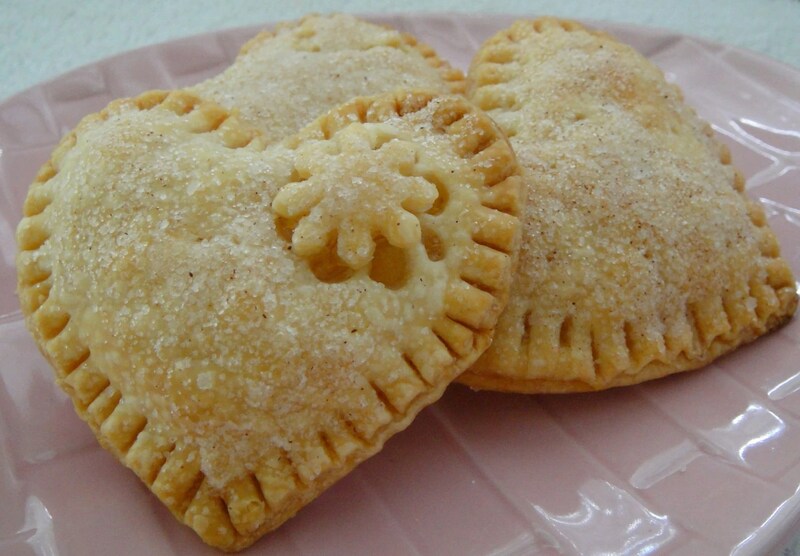 Instead of making entire pies, you could even make these sweet little heart-shaped single slices by Old Time Favorites and hide the ring in one of them for a fun wedding game! And though the white frosted multi-tiered wedding cake first introduced by England’s royal bakers in 1859 for the wedding of Queen Victoria’s granddaughter is what we have come to know as the “traditional” cake for the wedding feast, the idea of stacked confections came long before this. The French have been known to stack cakes for centuries for their wedding dessert tableaux and have been known to have a dispute or two in claiming who created the modern wedding cake. The traditional Croquembouche, a delicious pyramid of cream puffs stuck together with drizzled hot caramel could be the original inspiration for the stacked sponge cakes familiar to Americans today. 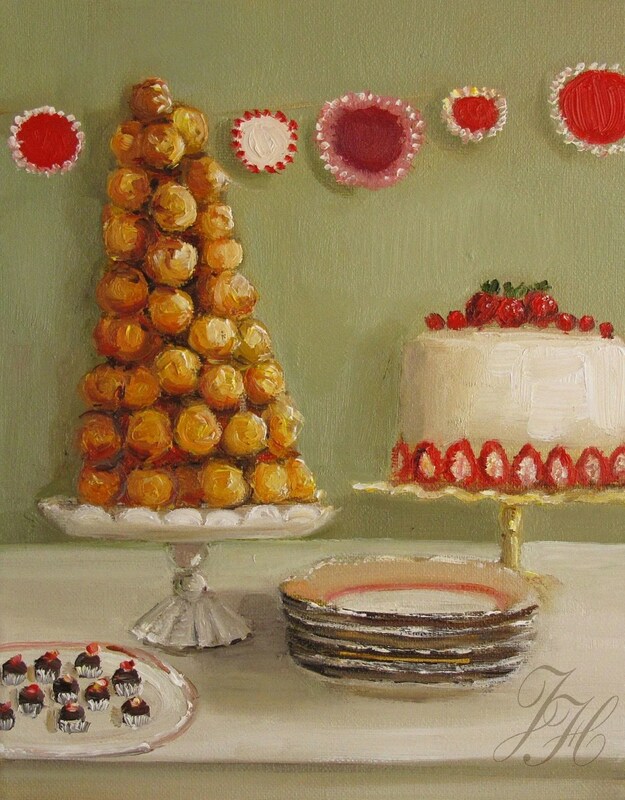 Sometimes these Croquembouche were stacked very high to invite newlyweds to lean over and try to kiss over the tower of sweetness, each time with more cream puffs being added. The higher the Croquembouche was piled without disturbing the kiss, the more children the newly wed couple would have. Does this mean only tall people are destined to have many children, you ask? Probably not, but it is a charming game, anyhow, which predates the Cake Kiss. You can make your own Croquembouche with any cream puffs recipe of your choice stacked and coated with caramel. And easier yet, you can just go to a nearby bakery for the cream puffs already made and then enjoying the fun sculpting part at home as you caramel-glue them together. Here is a lovely painting of this dish by artist Janet Hill. In the Caribbean, a very rich and decadent cake of native rum-infused fruits is made for the wedding feast and drenched with more rum before serving to guests. In Jamaica, guests who can’t make it to the wedding festivities are mailed preserved slices of this rum-pickled cake as a thoughtful souvenir. A very different kind of wedding cake souvenir is taken home by the bride & groom in Bermuda, in which a tiny seedling used to decorate the top of the wedding cake is planted in their new home as a symbol of their growing love. Ideally a long-living tree or herb bush.Whether or not you want a rich rum fruitcake, you can easily have a cake of your choice made while embracing this same tradition, embedding a contained sapling plant into the center of the wedding cake as a romantic gesture. Another alternative is this lovely cake topper inspired by the tradition. The Kransakaka wedding cake of Iceland is a towering structure of stacked almond cake rings decorated with icing and filled with an assortment of chocolates and sweets. A great idea for those who may not want to commit to eating an entire slice of cake. And if you are feeling really ambitious, there is a very similar almond ring cake served in Denmark which is the same recipe, but only turned over on its side and made into a cornucopia shape and filled with cookies and marzipan treats, or sometimes with whole candied fruits. The horn of plentiful fruits and sweets is supposed to represent a bountiful union in the years ahead. This post was brought to you by Auriana Lynn of MoonShineBaby. Visit her equally yummy shop here.